Show the world your identity! Events, retail, reception areas and anywhere else you can think of! BrightSign XD delivers superior technology for advanced digital signage applications, including a powerful 4K video decoding engine that supports all the technology standards of the True 4K ecosystem: H.265-encoded native 4K content at 60fps, CEA HDR10 and HDMI 2.0a for stunning picture quality. It is also capable of 4K upscaling and dual decoding two 1080p60 videos at once. All models include Gigabit Ethernet and over a hardware-accelerated HTML5 engine with advanced performance. BrightSign HD models are ideal for mainstream Full HD and HTML5 applications that require high reliability and ease of use. All models offer H.265 decoding, HTML5 rendering with mainstream performance, and Gigabit Ethernet. Robust interactive controls, live content features, BrightWall and Mosaic Mode make this set of players a perfect fitt for a wide range of applications. The Focus Kiosk is an interactive information kiosk with integrated 55 “LED touch display, and PC speakers. This modern and robust column is provided with WiFi connectivity and can be used anywhere. The display is easy to operate with precise dual touch technology. Inspire your visitor, tell your colleagues, present your collection and create an additional outlet. It’s all possible with the Kiosk! 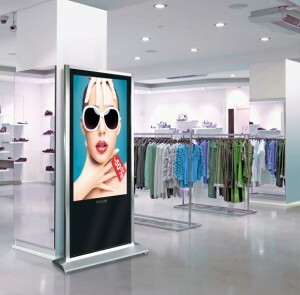 The integrated touchscreen uses infrared dual touch technology and is equipped with special kiosk software. This software allows easy use of the Kiosk to display any content such as games, PDF files, photos and videos.The screen may be independently mounted or be part of a network of monitors.